Suitcase mood is a Russian website with travel and tourism content. The term is also a popular expression widely used within Russian culture to describe the state of mind which grips a voyager on the brink of a journey. The mood is often associated with a ritual which involves the departing person sitting, sometimes accompanied by family or friends, in the vicinity (when not actually on top of) the packed suitcase, ostensibly to try to remember if there is anything they have forgotten to take and bid loved ones farewell. Sometimes, however, the phrase can take on a different, and rather darker, meaning. It can be used to describe someone who is fed up with the status quo, has become footloose and decided they simply want out. “This will never change,” might be the thought, “I’m leaving”. In my mind’s eye I even see the person having the thought seated on their suitcase adopting the posture of Rodin’s thinker, turning over and over again whether they are doing the right thing, even while those around them vent their sadness in a bath of tears and alcohol. Or maybe I have just been watching too many Russian movies. Naturally such a custom does not exist along Europe’s Southern fringe, which doesn’t mean it couldn’t be invented since the young and educated are increasingly leaving much to the chagrin of those they leave behind. Now, as I say, this “want out” phenomenon can now be found in many countries on Europe’s periphery (here, here, here and here), but the Ukranian case is an extreme one. So much so that the Ukrainians themselves have a word for those who have left the country in search of work and fortune elsewhere – zarobitchany. According to a 2011 report issued by the International Organization for Migration six and a half million Ukrainians, or 14.4 percent of the population, are now emigrants who have left their country (or rather they were at that point, since the 2013 number is certainly larger). Countries like Russia, the Czech Republic, Hungary, Poland, Italy, Portugal and Spain are among the most popular destination countries identified in the report. 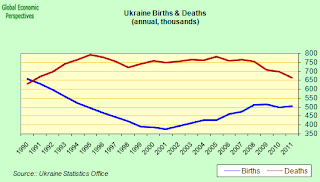 In all cases of low fertility societies young population exodus is a problem, but in Ukraine’s case it is well nigh lethal. The country has a little over 45.5 million inhabitants and the population is shrinking by 330,000 per year. 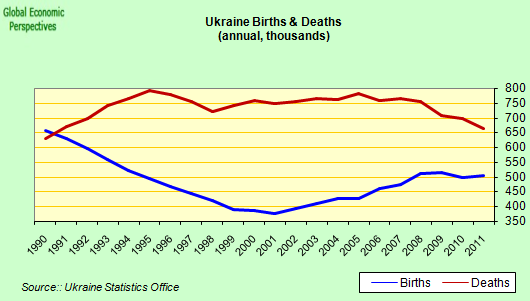 Besides the birth/death deficit emigration obviously contributes significantly to this sharp downward demographic trend (hat tip to Ukrainian blogger Veronica Khokhlova for most of the above). 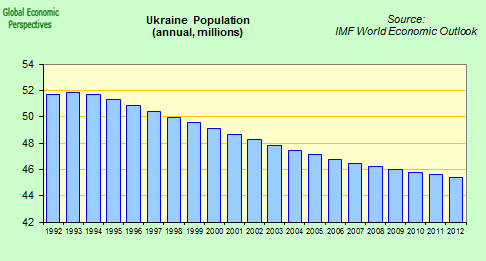 The latest UN population forecasts put Ukraine’s population at around 30 million by the end of this century, but this number is surely a highly optimistic one, in part because it assumes some sort of fertility rebound, but more importantly because it assumes that emigration won’t melt the country down much more quickly and much sooner than that. In addition to the smaller population the shifting age structures mean that the proportions of Ukrainians over 65 and over 80 will rise continuously. 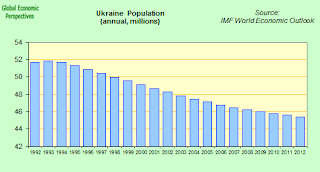 According to latest estimates Ukraine’s population in 2050 will look something like this. Obviously people aren’t leaving because the population is declining, but rather because the economy is not able to incapable of generating sufficient economic growth and sufficient jobs to encourage people to stay. There is a loss of confidence in the future of the country because the economic decadence becomes associated with degeneration in the political system. “People ran, are running and will run. So many have left [Western Ukraine] for Italy, Portugal and the Czech Republic, and have not returned, and more will leave. It’s just that [mostly people from] the provinces used to be leaving before, and now Kyiv is moving as well. People are taking their kids to study to Poland and some even further! It’s a difficult situation in the EU now, but it’s still livable, while in Yanukovych’s Ukraine it’s 100 times harder! Me, I came to the Czech Republic five days ago, sit here without a job, but I’m not going back home”. All of this puts me in mind of a fertility model developed by the Austrian demographer Wolfgang Lutz which he called the low fertility trap hypothesis. In developing this hypothesis his starting point was the assessment that “there is no good theory in the social sciences that would tell us whether fertility in low-fertility countries is likely to recover in the future, stay around its current level or continue to fall”. He then goes on to advance “a clearly defined hypothesis which describes plausible self-reinforcing mechanisms that would result, if unchecked, in a continued decrease of the number of births in the countries affected”. Claus Vistesen wrote up a description of the hypothesis on the Demography Matters blog (back in 2007) and I have some notes here. Obviously the number of live births fluctuates according to the number of women in a given population who are of childbearing age, which can be more or less depending on the size of the cohorts involved. But in general terms a country with 1.3 or 1.4 fertility will have steadily less and less children as cohort size drops. This is basically population melt-down, and this critical state can be triggered by a number of processes, including social and economic ones. Some country’s, as well as possibly being caught in fertility traps are also caught in liquidity ones, a connection which has not escaped the notice of Nobel economist Paul Krugman. While Krugman is surely not familiar with the fertility trap literature, he sees clearly that the low fertility Japan has experienced over decades has played an important part in the country getting stuck in a liquidity trap. As he puts it: “Why is Japan in this [liquidity trap – EH) situation? A debt overhang from the 1980s bubble surely started the process; but surely it’s reasonable to suggest that the demography also contributes, since a declining working-age population depresses the demand for investment“. Lutz already suspected that their might well be an economic feedback mechanism that would work to drive the number of children born in a country ever further downwards towards lower and lower levels, but I think the experience of the crisis has made this pathway a little clearer, in that those low fertility countries whose economic trajectories fall off a stable growth path may find it ever more difficult to get back on one again. In street jargon they could fall into a “lose-lose” dynamic driven by low-living-standards low-growth expectations and high unemployment. Not only do such negative economic conditions discourage young people from forming families and having children (obvious I think), they can also have the effect that young people leave in search of a better future thus reducing the potential number of children who can be born in the future. Naturally there can be a political dimension to the disintegration, as the need to implement ever less popular policies (especially policies unpopular with older people, those who do vote) leads politicians to become more and more demogogic while delivering less and less. Naturally the democratic quality of a country’s institutions starts to deteriorate under these circumstances, which only makes the young feel even more helpless and under-represented. This outcome is now becoming plain in much of Southern Europe, but it is obviously even more evident in Ukraine, where the former Prime Minister Yulia Tymoshenko is currently imprisoned, a decision which has just been roundly criticised by the European Court of Human Rights. So where does all this lead. Well it leads me personally to ask the question whether it is not possible that some countries will actually die, in the sense of becoming totally unsustainable, and whether or not the international community doesn’t need to start thinking about a country resolution mechanism somewhat along the lines of the one which has been so recently debated in Europe for dealing with failed banks. That something like this is going to be needed I regard as being what John Locke would have termed a “self evident truth”. As we know, in country after country each generation is getting smaller. While we can argue about exact timing, what this falling population means means is that GDP will eventually start to contract. This should make those ecologists who have long been arguing that the planet was over populated and that zero of even negative economic growth was desirable extremely happy. But what about the debt left behind by earlier generations, will that also contract? The Japan experience so far tends to suggest it won’t, and herein lies the rub. But this is only part of the problem, since the process of country decline, like most processes in the macro economic world, is non linear. That is to say critical moments or turning points will exist when suddenly things move a lot faster than expected. Hemmingway grasped the essence of this in his much quoted “bankruptcy comes slowly at first but then all of a sudden”. As the economy falls back, and the burden of debt grows on the ever smaller numbers of young people expected to pay, the pressure on those young people to pack their bags and leave simply mounts and mounts, accelerating the process even further. In fact populations dying out is nothing new in human history if we move beyond the most recent world delineated by nation states. In hunter gatherer times populations occupied increased or reduced proportions of the earth’s surface as climate dictated. In more modern times, islands have been populated or become depopulated according to economic dynamics (think the Scottish coastline). More recently, it is clear the old East Germany would have become a country in need of “resolution” had it not sneaked in under the umbrella of the Federal Republic. Why people should find the idea of country failure so contentious I am not sure, perhaps we have just become accustomed not to have “hard” thoughts. Applying the argument many apply to banks, unsustainable countries “deserve” to fail, don’t they? Why should the US or German taxpayer have pay to keep them afloat? Naturally, including Spain in this group of countries that can only now salute Cesar as they prepare to die my seem extreme, but just give it time. I expect (should I say “predict” in the Popperian sense, since this argument IS empirical, and is surely falsifiable) the first countries to die to be in Eastern Europe, with the most likely candidates to get the ball rolling being Belarus, Ukraine and Serbia. But then gradually this phenomenon will spread along the EU periphery, from East to South. Latvia’s own president said recently that if the net outflow of population was not stopped, within a decade the country’s independence would not be sustainable. I don’t think he was exaggerating. So, as these countries “die”, we (the rest of the international community) will have to decide what to do about them. A country “resolution” programme should be considered. The scale of the humanitarian tragedy will not be small. Now, from time to time conventional economists do start to have a glimpse of what is really going on. This happened to Paul Krugman a month or so ago when he came up with the memorable phrase that part of Japan’s economic problem was the result of a growing “shortage of Japanese”. Now, as I am trying to suggest, this shortage is not simply a local, Japan specific, phenomenon, but forms part of a global pattern. Again, exact timing isn’t clear, but sometime in the second half of this century global population will peak, and the shortage will steadily spread to take in all countries. To quote Krugman (in an earlier piece) again, at that point “to which planet will we all export“? Answers on a single piece of paper, in a plain white envelope, please. So the modern economic system becomes something like the game musical chairs. When the music is playing everyone gets up to dance, but each time it stops there is one less chair (country) to fall back on. And so it goes on and on, through numerous iterations. Now where’s my suitcase. I believe you are on to something essential: we have to invent a theory for steadily contractionary economies. Keynes dealt with temporarily contractionary situations and how to avoid them to become permanent in an environment with growth potential. The dominant neo-liberals assume a naturally long-term ever-growing economy, of course. 1) You focus on sovereign debt — which the State assumes can be dealt with thanks to an expanding population and a higher GDP. Private debt is often even higher — and unsustainable as well in a contractionary environment: real estate can never recover if demand and income are depressed permanently (hence mortgage will implode); consumer debt and student loans will not be repaid in an environment where GDP, hence capacity to service them, is going down in the long run. The entire finance, banking, stock exchange activities are based on huge amounts of (often hidden) debt, and assume an expanding market/economy to carry on. 2) We already reached peak helium and peak oil, some are foreseeing peak clean water, peak agricultural land and peak copper soon. Reduced populations could be a godsend when resources are dwindling, but the entire economic system is based on expansionary mechanisms — these combined peaks will only reinforce the consequencs of the demographic processes you have described. 3) The struggle for a share of income will be downright murderous in a contractionary environment — since the game will become at best a zero sum one. We have a glimpse in what is happening between the core and periphery of Europe nowadays, and hints regarding trends of income distribution in the last 30 years or so. When, as you suggest, countries will start “stealing” population from each other on a grand scale, things could get really nasty. I look forward to your further articles — perhaps ideas on how to deal with this new environment? Can countries die? Yes. Somalia already has. What’s happening in Ukraine is just a different kind of death. Ukraine has only “a little over 45.5 inhabitants”? That’s not even enough to form a football league. And who’s the last half person, anyway? As you suggest, this sort of population implosion is not unprecedented in history. It’s most visible on islands, because their isolation meant that nearby populations did not expand into the emptied territories. But there’s a point there: When populations imploded in *non*-island cases, surely some fertile neighbors happily replaced the population. But here’s the thing: Who will move into a depopulated Ukraine? Russians? They are also far short of replacement-level fertility. Germans? In the 40’s they would have appreciated the invitation to a Ukranian Lebensraum, but since then, they’re also dealing with a very low fertility. The plains of Ukraine are an incredible breadbasket that produces tons of grain, and can produce far more with some modernization. People absolutely will move there. It’s nice. But the question is who. I think that we just don’t know. Lots of theoists of the low-fertility phenomenon predict that it must be a temporary phenomenon. Consider: There are always going to be subportions of population with far-above-replacement fertility. In the USA it’s the Mormons. In Israel it’s the orthodox. In general, traditional Muslims have above-replacement fertility. If present trends continue, the current majorities will be replaced by the more fertile now-minorities, and the era of low fertility will be over. I suppose it’s possible that as Mormons become a larger proportion of the population, their fertility will begin to match the US average. But even then, there will be a highly-fertile subgroup of the Mormons that replace the Mormons that are less well disposed to large families. Ultimately, there may be a genetic feature that increases the probability choosing large families, or the conditions correlated with it, like a preference for orthodox religions. The latter is clearly transmitted culturally, but that may be less robust over time than straight-up genes. Those genes might be spreading right now, and we’ll see their effects in not too long. The point of that digression was that the humans of our planet will at some point crank out enough progeny so that non-marginal land like the Ukraine will absolutely be populated. The only questions are: By whom, and how will the transition look? What would the situation look like for a hypothetical sizable economic zone which is demographically stable? That is, a birthrate of 2,1. Neither over or under. No net immigration or emigration. Potential growth? Debt dynamics? Inflation? Employment? Modern cultivation of cereals, especially in those vast expanses inherited from kolkhozy and sovkhozy, is a highly mechanized affair that requires very, very little manpower. Modern flour mills, bakeries and transport of (agricultural) goods are highly automated as well. I.e. no jobs for all those people supposedly moving in — or for those Ukrainians already present, who are therefore leaving in droves. Hi Mr. Hugh. Thanks for the latest post. Always good stuff. Since 1500, Europe’s percentage of world population has dropped from 18% to 11% … but North America has grown from 0.7% to 5%. So overall, that’s nearly a wash. Asia has grown a bit from 53% to 60%. Africa has declined from 19% to 15%. Populations have always grown and shrunk. Clearly economists and sociologists need to understand better what this means for the modern national economy, but “dying” seems a bit dramatic. The burning issue is not that Europe’s share of world population is going down, but that the population of several European countries is shrinking _in absolute terms_. You say that Ukraine, Belarus and Serbia will be the first to die, but what might come after? For Ukraine and Belarus, I suppose the answer is relatively simple: split them, somehow, between Poland and Russia, plus some bits of Ukraine to Romania. But who gets the carcass of Serbia? Croatia? Bosnia? Bulgaria? Russia is dying too. Maybe even larger scale than Belarus or Ukraine. Other Balkans states also, not just Serbia. Almost quarter of the Croatia territory is depopulated, huge parts of Bosnia, too. But in Balkans, it’s pretty clear, low fertile Slav nations will be replaced with high fertile Albanians.